Acacias (Acacia spp.) make up a varied group of shrubs and trees native to warmer parts of the U.S. or to Africa, Asia, Mexico and South America. Many have showy, sometimes fragrant flowers and are especially tolerant of heat and drought. Acacias can grow in a yard when given the right conditions and some basic care. Acacia trees grow best in a sunny spot that gets full sun for most or all of the day. Depending on the variety, they can tolerate short periods of below-freezing temperatures, especially once well-established. For example, the evergreen shoestring acacia (Acacia stenophylla) grows 20 feet tall and wide in U.S. Department of Agriculture plant hardiness zones 8 through 11, while the semi-evergreen sweet acacia (Acacia farnesiana) grows 15 to 25 feet tall and wide in USDA zones 9 through 11, where winter temperatures can drop to 10 and 20 degrees Fahrenheit, respectively. In areas with cold winters, plant the tree near a south- or west-facing wall, or on top of a slope. To avoid crowding, allow at least the width of a mature tree between each tree -- for example, about 20 feet between shoestring acacias. Acacias grow well in most types of garden soil, including loam, sand or clay, provided it's well-drained and doesn't stay waterlogged. Acacias are also quite tolerant of drought, but you can lessen the stress on a young tree during a dry spell by providing supplemental water, aiming for about 1 inch per week, including rain. Mulching the area under the tree also helps conserve moisture while keeping down weeds that compete for water and soil nutrients. Keep mulch back about 6 inches from the tree's trunk to prevent moisture and insect damage to its bark. Acacias, including shoestring and sweet acacia, have a naturally treelike habit, an upright and spreading, or a vaselike shape, respectively. A young tree benefits from annual pruning for the first few years, but prune only in midspring in colder areas, when danger of spring frost has passed. For the shoestring acacia, choose one or two central, upright stems and prune away others, including any thin, straight shoots, or suckers, that might arise directly from the roots. Remove side branches that form on the lower parts of these stems, until the main trunk is a few feet tall. Prune out any branches that are shaded to open up the inside of the tree, as these branches have a tendency to dieback and fall in strong winds. This allows the remaining branches to grow stronger and suffer less wind damage. For vase-shaped varieties, including sweet acacia, pruning isn't necessary unless the tree is in an area frequented by pedestrians or vehicles -- if so, prune off lower branches when the tree is young to prevent problems. Disinfect your pruning blades by wiping with rubbing alcohol between cuts to avoid spread of plant diseases. Acacia trees don't require fertilizer and usually have few if any pest or disease problems. 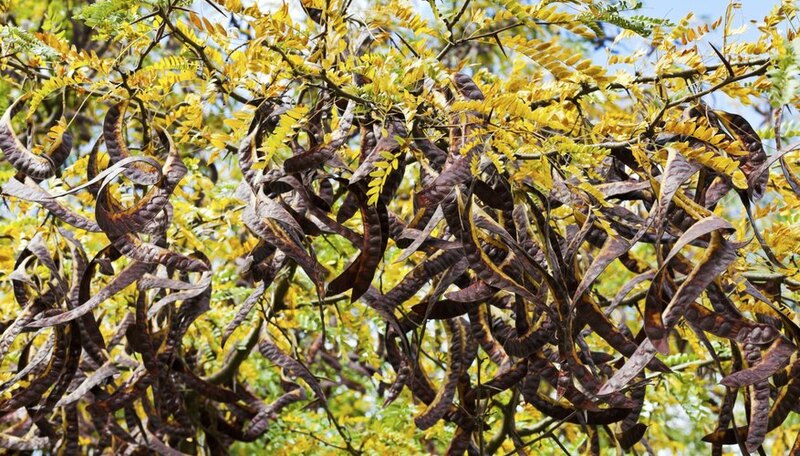 Several varieties, including the shoestring acacia, produce large seed pods that can be unsightly when they drop in summer or fall. This variety also tends to have weak branches that can break in wind storms -- prune damaged branches off as soon as you see them. The silver wattle acacia (Acacia dealbata), which grows in USDA zones 9 through 10, can be invasive in some parts of the U.S., spreading by sending out underground stems, or rhizomes, that can also interfere with other plants. Wind can also spread the tree's seeds widely, so it's best to avoid planting this variety.